The common earwig (Forficula auricularia) is a night-feeding insect that transforms into a pest when it feeds on garden offerings, particularly plant shoots, foliage, and flowers, as well as the occasional ripened fruit. While earwigs can benefit your garden by consuming decaying organic matter and the larvae of predator insects, snails, and aphids, they can be extremely problematic when their appetites turn to your prized tomatoes or the silk on your developing corn crop. Earwigs are usually ¾ inch long, and have long, flat, red-brown bodies with sharp pincers at the end of the tail, used for both capturing their prey and mating. Wings can be found on a few species; however, earwigs are not strong fliers and will crawl in search of food. Their unique name is derived from a superstition that earwigs crawl into the ears of sleeping individuals and bore holes into the brain. Luckily, this terrifying tale is untrue – earwigs are a nuisance, nothing more. While they occasionally enter your home, they will not establish a presence inside and prefer to reproduce outside. Their main object is your garden, so removing them from your outside property will be the primary function of any extermination process. Remove garden debris: Earwigs live and breed in debris and mulch. By keeping your garden tidy and free of excess pilings where they can hide and breed, you greatly reduce your chances of a continued earwig presence. Get them where they crawl: Earwigs seldom fly, and as a result, applying an adhesive strip to areas where they crawl, such as tree trunks, shrubs, and woody plants, can help prevent them from reaching their sought-after leaves and fruit. We have recommended Tanglefoot Pest Barrier, with positive results. Diatomaceous earth: Looking for a natural-but-effective pest solution? Diatomaceous earth is a soft, porous sedimentary deposit made from the fossilized remains of diatoms, or tiny, aquatic creatures. While harmless to humans and pets, diatomaceous earth offers microscopic shards that cut into and eliminate insects as they crawl through the mixture. Sprinkle on the foundation of your home, along your walkway, and around trees for best results. 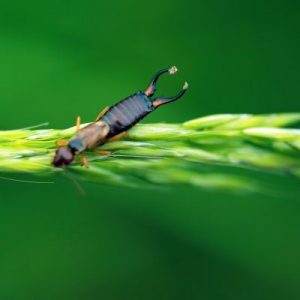 Botanical insecticides: If earwigs continue to plague your property, botanical insecticides are an excellent option and can be used for spot-treating problem areas or spraying into cracks and crevices where earwigs may be breeding. Our team at The Bug Man can recommend various garden-friendly options and will even apply the treatments if you would prefer a professional to handle the process. If you have tried the above natural solutions and earwigs continue to create havoc in your garden or are running amuck in your yard, it’s time to contact a professional who can help you start anew. Our specialists at The Bug Man are here to help you and can recommend and implement a wide variety of earwig-removal processes.